Cotton is one of the softest things you can sleep on, but it comes at a price. 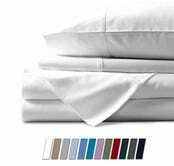 Amazon is thankfully helping you out there with their sale on 100% Egyptian cotton, 800 thread count sheets from EL&ES Bedding Collections. Grab a queen set for $65 or a king for $70 (plus other sizes too), with your choice from eight different colors. While you’re gonna want to sleep on these sheets, don’t sleep on this deal because it ends today.